Professor Edgar Choueiri is Director of Princeton University's Program in Engineering Physics, and Director of Princeton's Electric Propulsion and Plasma Dynamics Laboratory (EPPDyL). He is tenured Full Professor in the Applied Physics Group at the Mechanical and Aerospace Engineering Department, and associated faculty at the Astrophysical Sciences Department/Program in Plasma Physics at Princeton University. He holds a PhD in Aerospace Engineering/Plasma Science (1991) from Princeton University. He has been the Principle Investigator (PI) in charge of directing and managing more than 30 competitively selected research projects, (totaling more than $10M of funding) funded by NASA, AFOSR, the National Science Foundation, and other governmental and private institutions. He has been PI and Co-PI on two space experiments onboard the Space Shuttle and the Russian scientific spacecraft APEX. Professor Choueiri's laboratory (EPPDyL) at Princeton University, a recognized center of excellence in research in the field of advanced spacecraft propulsion, has been continuously funded by NASA since he became EPPDyL's Chief Scientist in 1996. Prof. Choueiri is the author of more than 160 journal articles, conference papers and encyclopedia articles on plasma thrusters, plasma physics, instabilities and turbulence in collisional plasmas, plasma accelerator modeling, space physics and applied mathematics. He has been an invited speaker on more than 55 occasions at symposia and leading institutions in the USA, Russia, China, Japan, Poland, Italy, Lebanon, Turkey, UAE, and many countries in Western Europe. He is the recipient of a number of awards and honors and was recently elected President of the Electric Rocket Propulsion Society, whose members include hundreds of scientists working on plasma propulsion for spacecraft in more than 15 countries. He served as the elected Chair of the American Institute of Aeronautics and Astronautics' Electric Propulsion Technical Committee (EPTC) from 2002 to 2004, the leading professional society in his field, and was awarded the AIAA's distinguished service award for his role as Chair of the EPTC. He was elected Fellow of the AIAA in 2008 and has received numerous honors and awards, including a knighthood from the President of Lebanon, his native land. He was selected by NASA in 2004 as the winner of a competition to lead a team of NASA and academic researchers on a 3-year research project to develop a high-power plasma rocket system intended for the robotic and human exploration of the Moon and Mars. 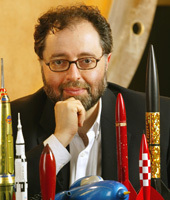 He has developed a number of new undergraduate and graduate courses at Princeton University, advised more than a hundred students, currently advises 6 PhD students, and has graduated 11 PhD students, 8 of whom are currently working as research scientists in plasma physics or space propulsion. In 2009 Professor Choueiri, who has been interested in audio, acoustics and classical music recording for many years, invented a new technique for producing tonally pure 3D sound from two loudspeakers. The technique allows a listener to hear sounds located in 3D space as they would be heard in real life. The new technology, called BACCH 3D Sound, is currently being licensed by Princeton University. It is already being used in consumer audio products and in professional audio. He and his work have been profiled widely in international media including the BBC, The Discovery Channel, National Public Radio, The New Yorker magazine, The Atlantic magazine, Le Figaro, and various newspapers and magazines in the US, Europe, the Middle East and China. Professor Choueiri's ongoing research projects are described at EPPDyL's website where there is a search engine that can be used to search and download many of the laboratory's hundreds of publications. B. Jorns and E.Y. Choueiri Stochastic threshold for ion heating with beating electrostatic waves. Physical Review Letters. 110 No. 24, (110.245002), 2013. B. Jorns and E.Y. Choueiri Stochastic ion acceleration by beating electrostatic waves. Physical Review E. 87 013107, January, 2013. D. Lev and E.Y. Choueiri Scaling of Efficiency with Applied Magnetic Field in Magneto- plasmadynamic Thrusters. J. Propulsion and Power 28, No. 3 pp. 609-616, 2012. B. Jorns and E.Y. Choueiri. Ion Heating with Beating Electrostatic Waves. Physical Review Letters PRL 106, 085002 (2011), February, 2011.